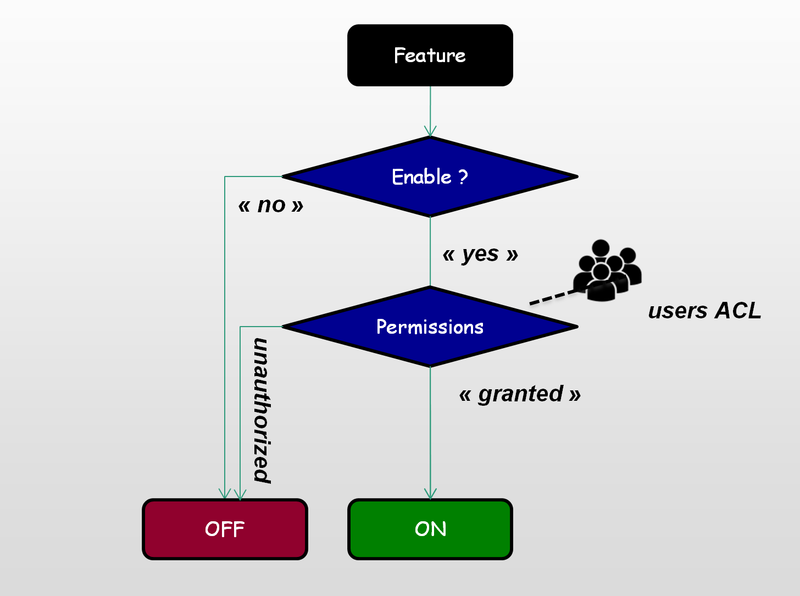 Also called features flag, it allows to enable/disable features at runtime without deployment. During developments you implement multiple behaviours in your code. At runtime, the executed one is selected by evaluating conditions. Grant features based on roles and groups. Sometimes called Canary Release it allows to tests new features without involving everyone. 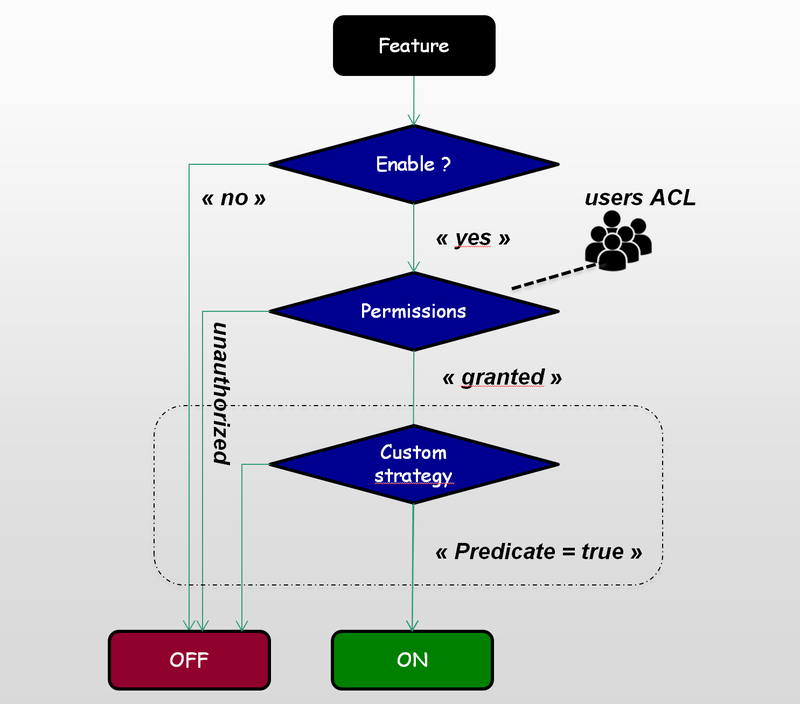 Different security frameworks can be used like Apache Chiro or Spring Security. Implement your custom predicates to evaluate if a feature is enabled. 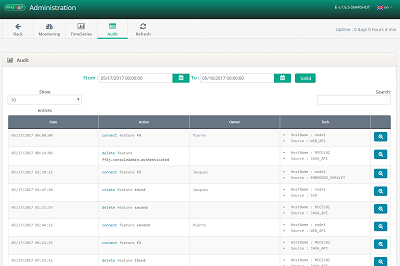 There are some provided out of the box like White lists, Black List, Office Hours, Expression based. A bridge is also provided to rely on real Rules Engine like Drools. Avoid nested if statements in your source code, instead decorate your code with annotations. 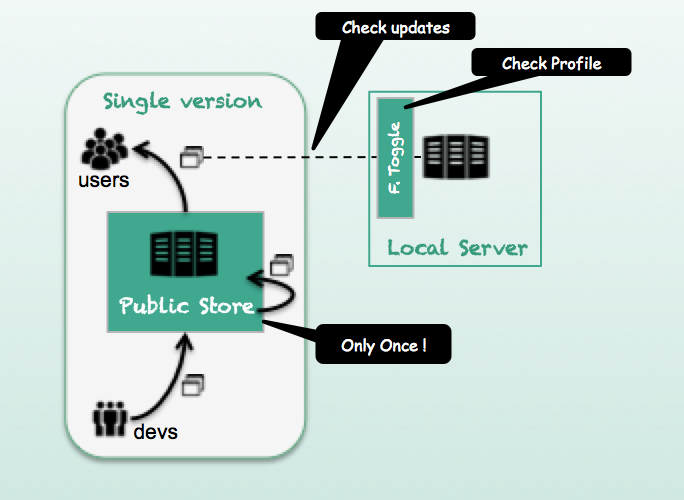 A dynamic proxy will pick up correct implementation at runtime based on feature status. It improves readability and maintainability. As a dispatcher for features we are able to record all features usage (hits) and compute metrics based on different KPI like users, sources or hosts. 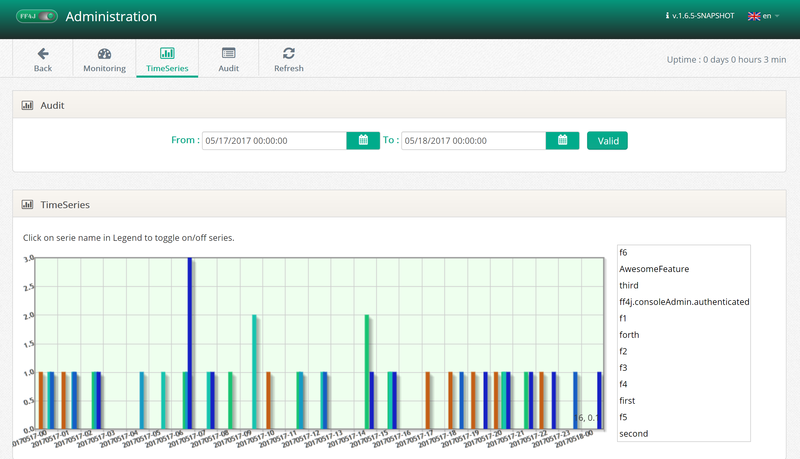 Dashboards allow to search and filter in history. 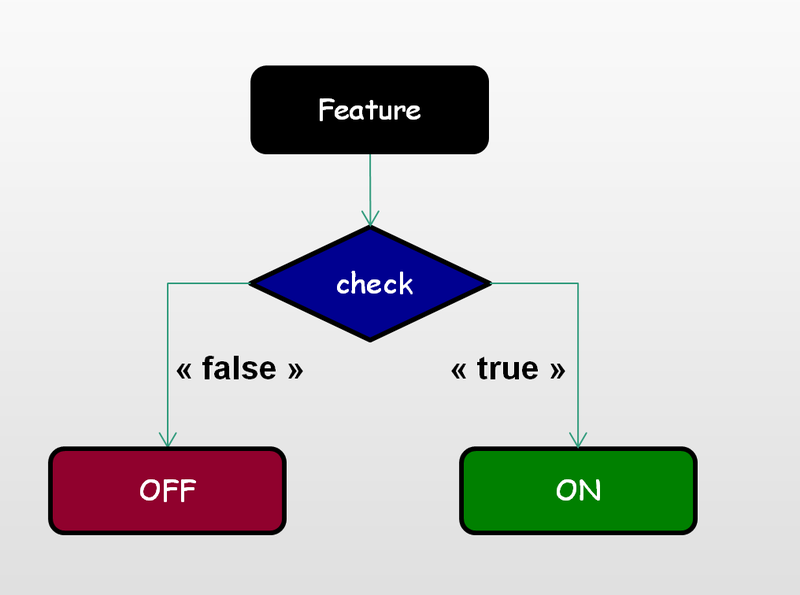 Save operations performed on both features and properties (CRUD) in order to troubleshoot and provide auditability. 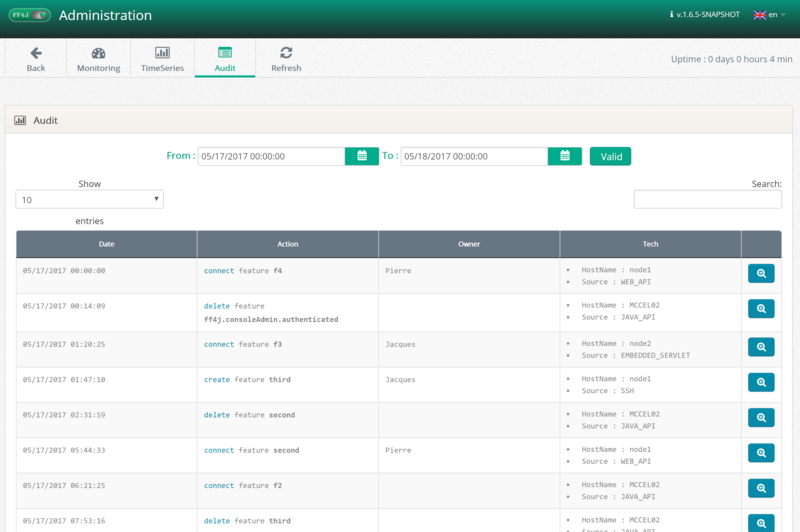 With permissions management enabled it's possible to identify each user operation. 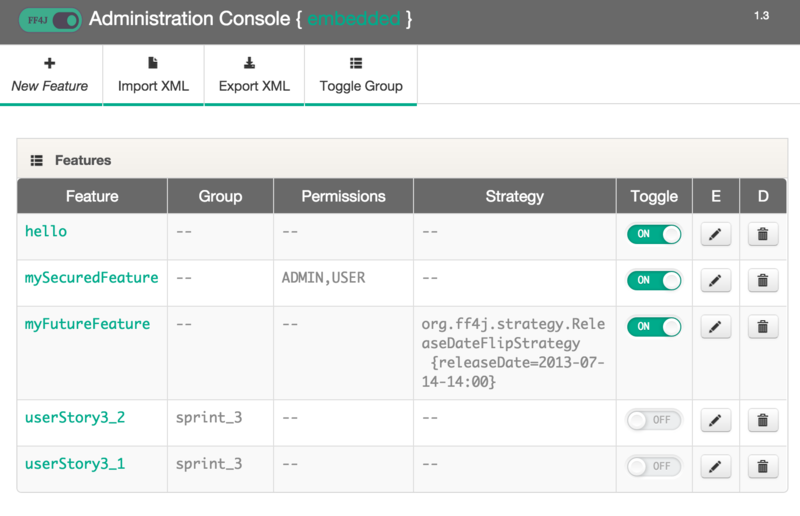 Perform administrations operations through nice i18n web console: features, caching, properties but also audit or settings. Packaged as a servlet it meant to be embedded in your applications. Not all applications provides web interfaces. In production, you will probably work with SSH. Command line is very convenient for scripting and automation. 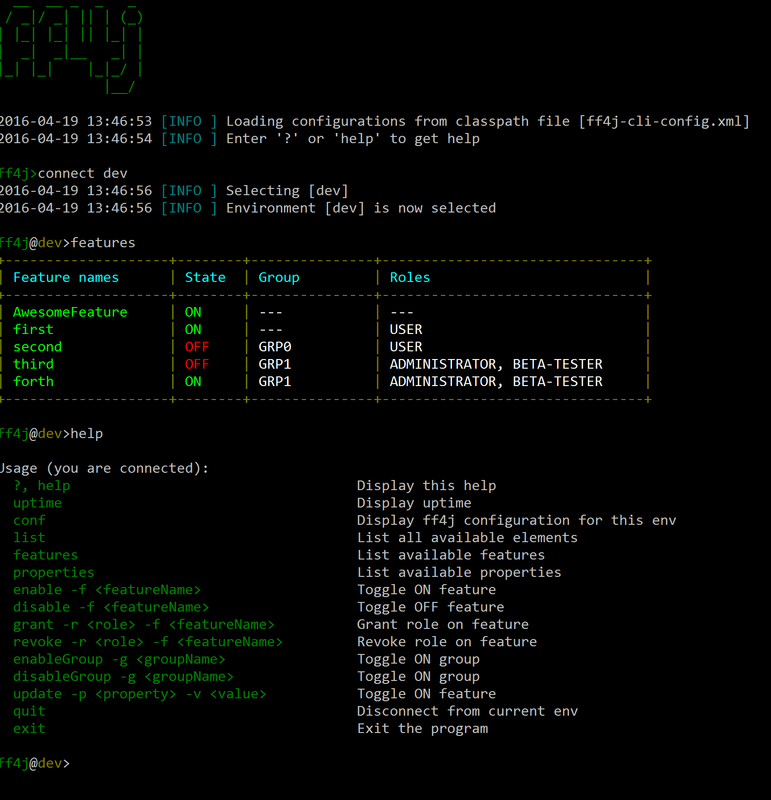 Because 60% of devops guys are ops here is the CLI. Treatments like batches cannot use web UI nor CLI. 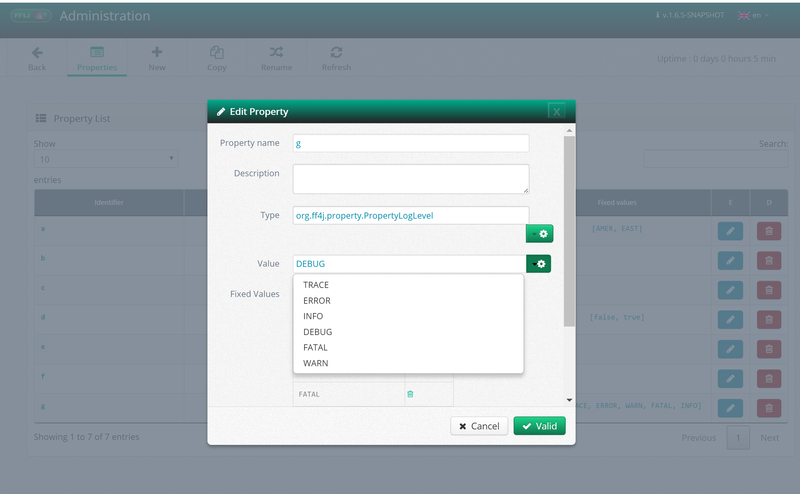 MBeans are provided to operate through JMX. 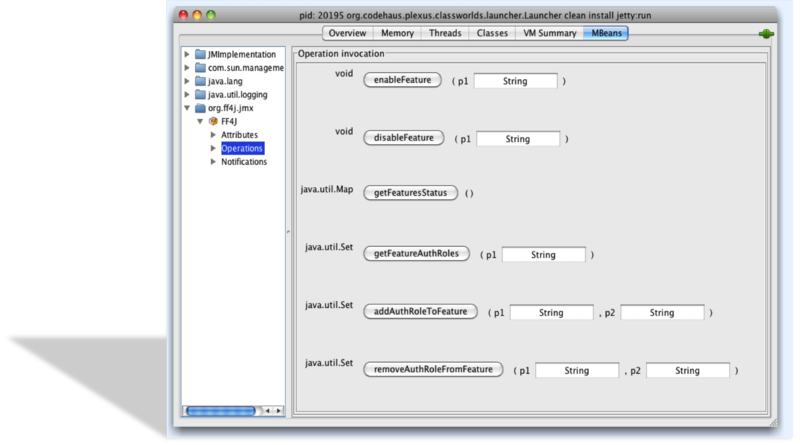 Tools like Java Visual VM to operate. It is also the opportunity to plug supervision tools like Nagios. DB used for features states are good candidate to externalize configuration and store any properties. Inject properties and edit values at runtime. 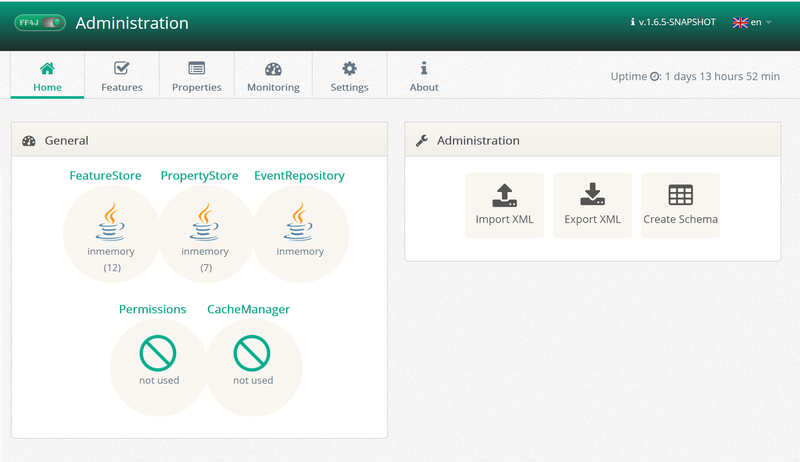 Integrated with Spring, Archaius and commons-config or Consul. To resolve feature state you have to hit DB but some storage are slow. 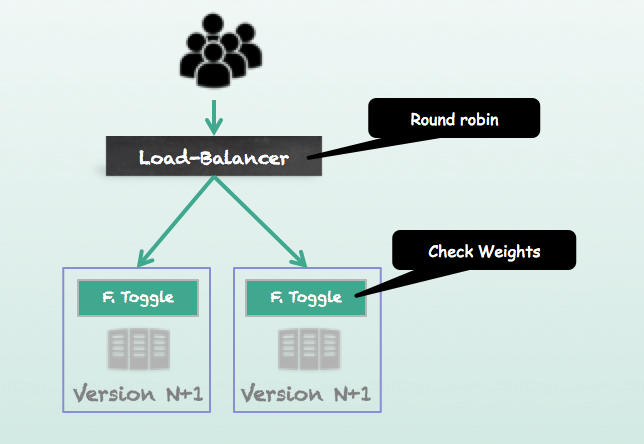 Leverage on caching (near or distributed) to speed up applications. 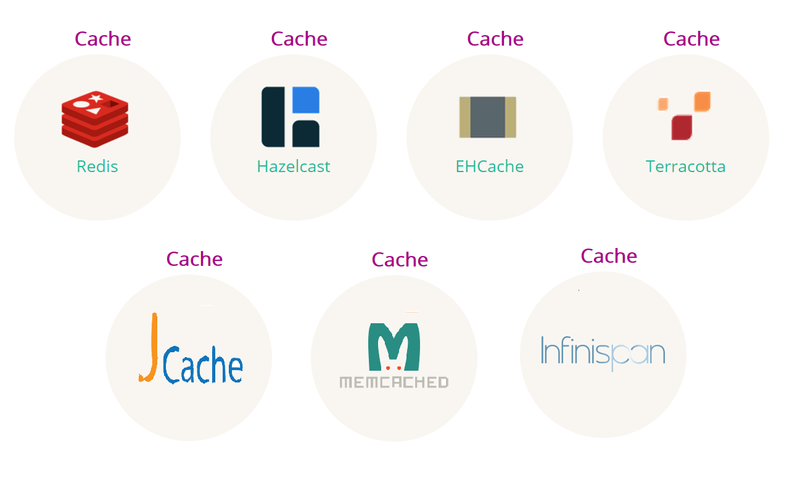 Most Cache solutions implemented like EhCache, Hazelcat, Redis or Ignite. Resolve all dependencies by using provided spring-boot-starter library. Very useful in microservices as handle distributed configuration, service registry (consul) and feature toggle of course. 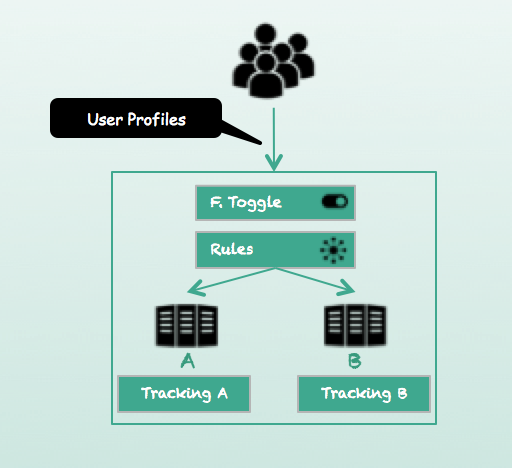 Feature toggle is meant to be implemented in any application layer including UI. 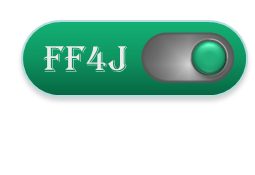 Use FF4j with any technologies by integrated the provided rest API. As for web console it's a single servlet to declare. In this section we will create a sample from scratch, skip first steps if you already have a working project. First, create a simple web project with dedicated maven archetype. 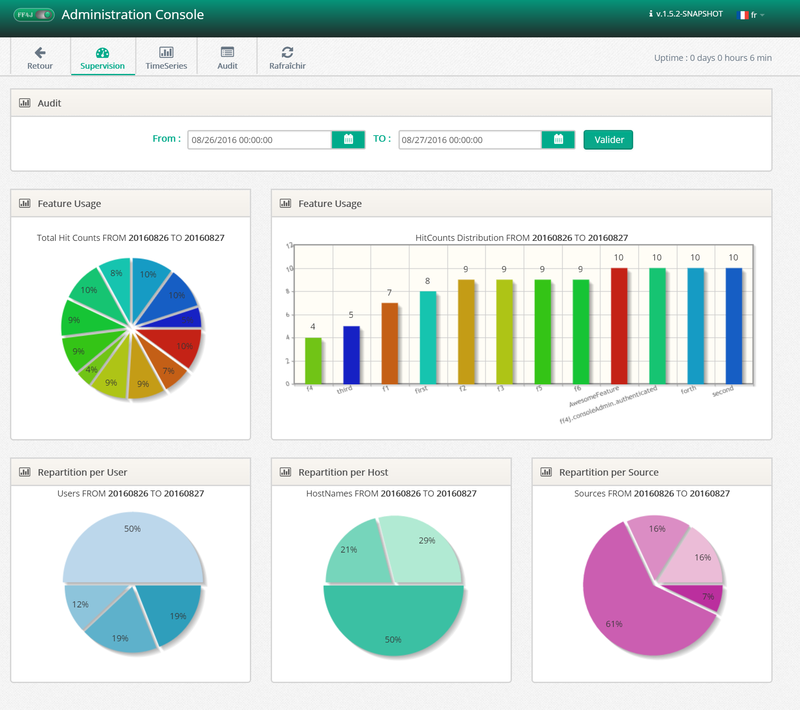 We could have chosen a basic archetype but we could like to show you the web console. Import the project in your favorite IDE, open your pom.xml file and add the following dependencies. JUNIT should already be provided but with a quite old version. If required, the maven project folders (src/main/java, src/test/java....). In the folder src/test/resources, create the following ff4j.xml file. We should have put you a single feature but let's illustrate immediately some great capabilities. In the src/test/java, create the package org.ff4j.hello with the following JUNIT class. We put several use cases to give you an overview. As I use to say, a piece of code is much clear than a long paragraph. In production you probably won't toggle Off your features programmatically (maybe to implement a circuit breaker), instead you will toggle features through web console. FF4J provided 2 consoles : one is embedded as a servlet, the other is a full-stack application (operating with remote components through REST API). Here we will demonstrate the usage of the embedded. Add the following dependencies to your pom.xml file. The, add the following statement within <build> tag. The purpose here is to execute our web application on jetty container using the proper maven plugin. We also add src/test/resource to jetty classpath, where we created the ff4j.xml file. The administration console needs to find the instance of FF4j to operate features. You have to define a class implementing org.ff4j.web.api.FF4JProvider and reference it when declaring the servlet. Note : If your are working with any dependency injection framework like Spring Framework you will probably inject ff4j as a bean it, but, here, we want to avoid any dependency. Every operation performed through this console are performed in-memory. At next restart, the state will be lost. 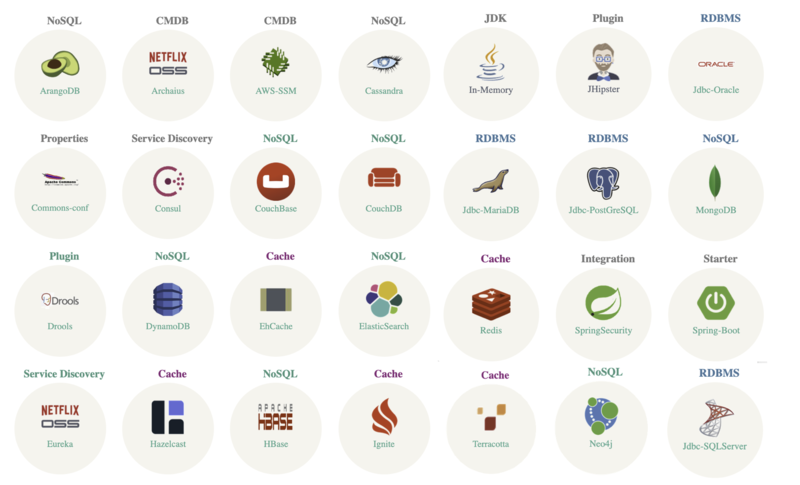 To avoid this behavior you will need to change the FeatureStore and choose among JDBC, MongoDB or Redis. 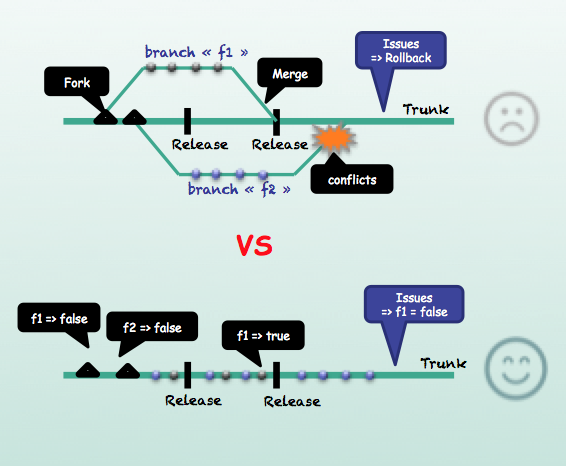 Feature branches lead to conflict during merges. 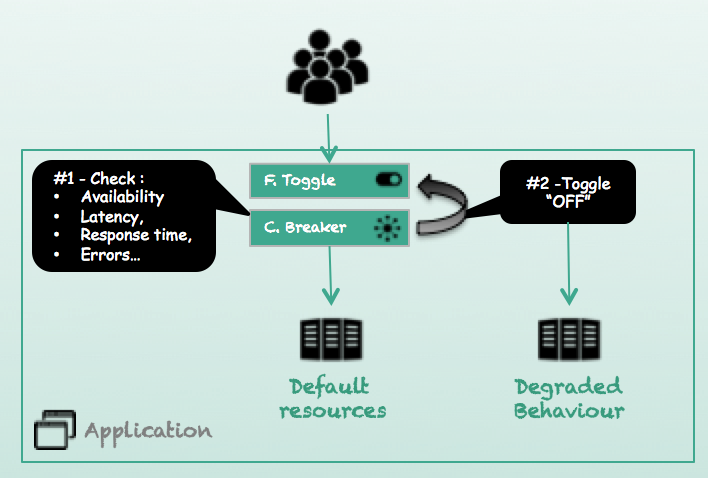 Use trunk-based-developpement to toggle-off unfinished code when develop continously. 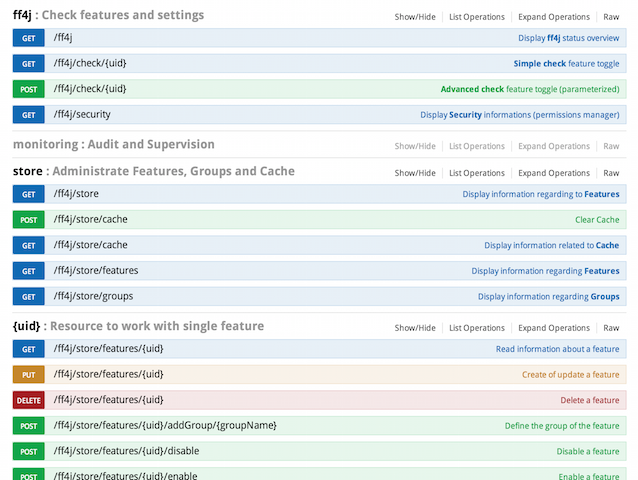 Avoid clusters nodes inconsistency during deployment and deliver new features desactivated. 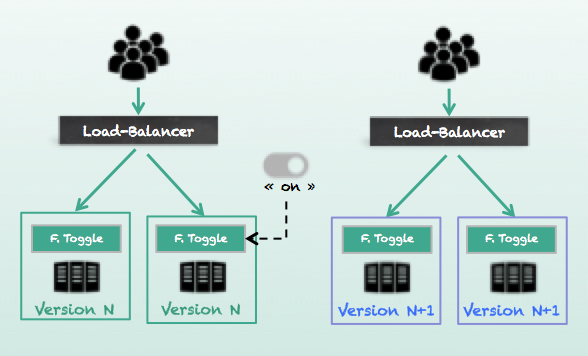 Toggle "ON"" when all nodes are up-to-date and ready. Do not create dedicated infrastructure to qualify new features. 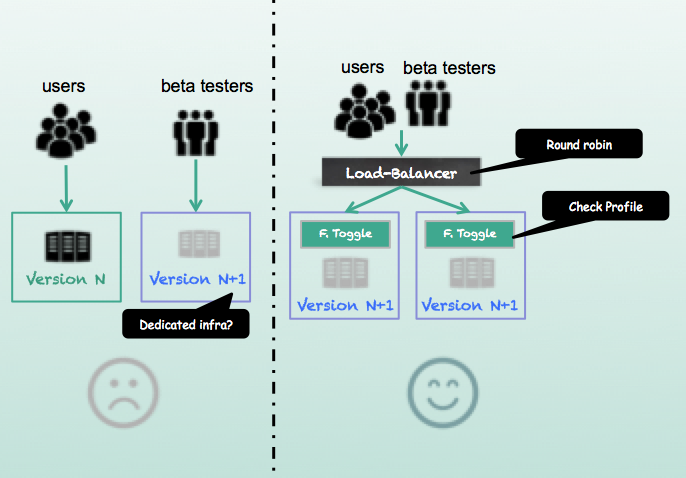 Open them for subset of beta-testers and directly into production environments. Measure performance impacts of new features. 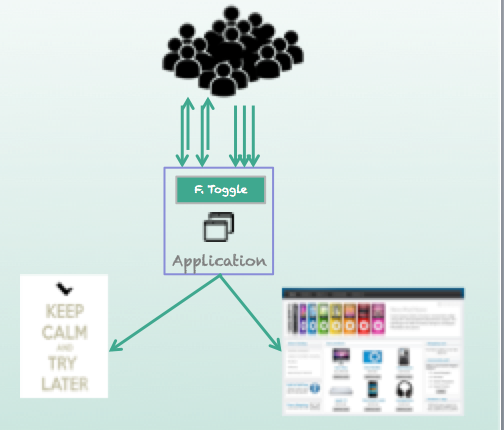 Activate them dynamically on a defined ratio of incoming requests and observe system responses. Tune and protect your system of heavy loads: focus on high business value requests and discard others dynamically (clients vs prospects, carts contents..). Avoid annoying frequent deployments and downloads of mobile applications by providing empty shelf: request expected active features to YOUR servers. Split A and B populations using a business toggle. Measure business impacts not only with CRM but also hitcounts of very same framework. 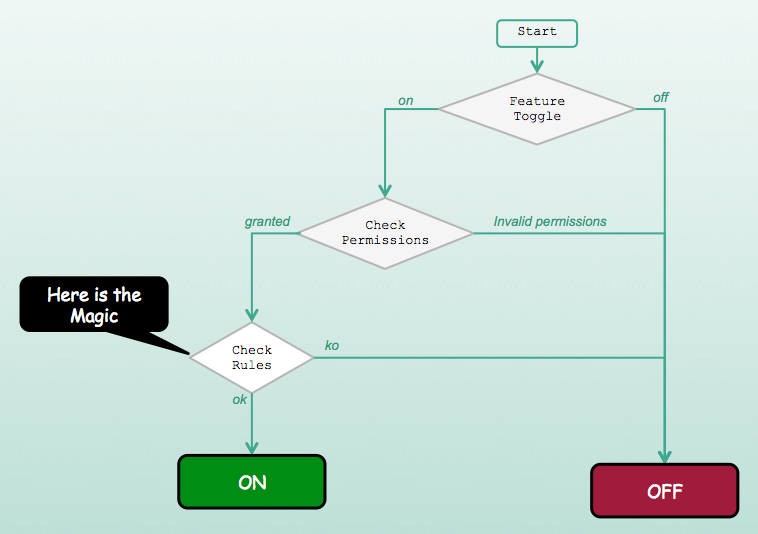 Implement the circuit breaker pattern with a dedicated strategy and custom rules allowing to toggle off proactively not available features. ff4j© 2013-2016 - All right reserved.